First this park was a part of the Rungwa Hunt Reserve, being the third in extension of Tanzania. In spite of it and of being the most virgin and containing the largest elephant population of Tanzania, is one of the fewer visited because of its relative inaccessibility. The name derives from the Ruaha River which flows along its entire border creating spectacular gorges. 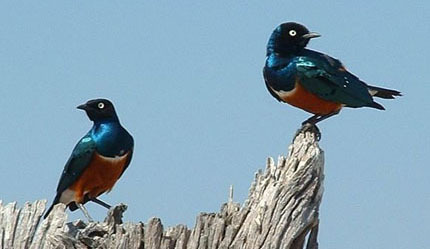 Is a birdwatcher’s paradise as there are 350 species of birds that are not found in northern Tanzania. The river unite to the Ulanga forming the Rufiji river whose name means “Big River”, word of the Hehe tribe . The river provide electricity to a great country area, including the capital Dodoma. Few kilometers ago the gate of the park we find Tungamalega village. The visit to the village, accompanied with the local guide, is an unforgettable experience. We can discover their way of life, visit the school and maybe its students delight us with songs and traditional dances. The medicines and the school material are scare and that will be very well received by their inhabitants. Of 110 to 1,250 meters above sea level. Impala, warthog, elephant; buffalo; hippos; giraffe, zebra, crocodiles; lion; cheetah; leopard; wild dog and lots of antelope; Greater and Lesser Kudu; roan and sable antelope; and Grants gazelles. 615 km from Dar es Salaam. The best months to go are from July to November. Luxury lodges, camp sites, bandas and aerodrome. Tungamalenga Bandas (outside the park) and Ruaha Bandas (inside the park).